7:30 p.m., Page Hall, 135 Western Avenue, University at Albany Downtown Campus. 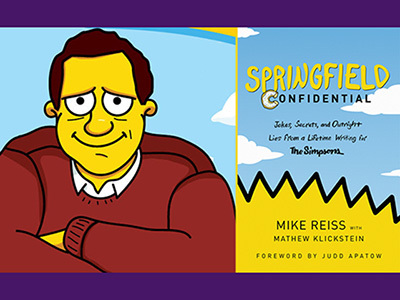 Mike Reiss, legendary TV comedy writer, is the longest-serving writer and producer of THE SIMPSONS, the most enduring prime-time series in TV history. Reiss joined the show to work on the very first episode in 1989, and continues to be involved 30 years later, more than 630 episodes later. The comedy show features biting social satire and in at least a few examples, an ability to predict the future. An episode that aired in March 2000, predicted a Donald Trump presidency. In a 2010 episode titled "Boy Meets Curl," the U.S. Men's Olympic Curling Team won a gold medal, beating out the favorite, Sweden. That very result happened for the first time at the 2018 Winter Olympics in South Korea. His new fan guide, Springfield Confidential: Jokes, Secrets, and Outright Lies from a Lifetime Writing for The Simpsons (2018), provides an inside look at the production team’s creative process, and features interviews with fellow writers, as well as animators, actors and celebrity guests. “Always entertaining and frequently laugh-out-loud-hilarious” (Booklist). Reis wrote for the Harvard Lampoon while a student at Harvard University and was hired by National Lampoon following his graduation. He wrote for comedians such as Johnny Carson, Joan Rivers and Garry Shandling, co-created the animated series THE CRITIC, created and wrote the webtoon QUEER DUCK and has also worked on screenplays including: ICE AGE: DAWN OF THE DINOSAURS, THE SIMPSONS MOVIE and MY LIFE IN RUINS. Reiss has also published 17 children's books, including How Murray Saved Christmas, and has won an Edgar Award for his mystery story Cro-Magnon PI, published in Alfred Hitchcock's Mystery Magazine (July/August 1999).